The argument over whether to leave the European Community, or stay in and try to bring it closer to what London would like it to be, has split the Conservative Party. Whatever the outcome of the referendum, it probably means the end of the tenure of Prime Minister David Cameron who has opted for staying in against the Party’s possible majority of “Euroskeptics” At a time when the opposition Labor Party leadership has been grabbed by ultra-leftists who want to go back to the old socialist tenants of the movement, that is likely to produce a fractious political scene, trimming Britain’s traditional worldwide commanding role. In turn, it is going to limit the supporting – and often leading – relationship that Washington has relied upon with Britain’s traditional worn but still abundant worldwide imperial heritage. President Barack Obama not only chose not to use it, but made a fetish of his anti-English prejudices. London Mayor Boris Johnson, left and Prime Minister David Cameron. A new president, however, even Hillary Clinton who quietly is rejecting much of her support of Obama as his secretary of state, is likely to again look to the traditional “special relationship: between the U.S. and the U.K.
Britain, of course, always had its reservations about joining the EU. London’s City role as one of the principal world financial centers, in part based on the universality of the British pound sterling, always negated joining the EU’s monetary union. But now with the Euro under attack, Germany’s Angela Merkel and her allies in the rest of Europe, not only want to reinforce the Euro but to move toward further political integration. In effect, there is a general consensus on the Continent among the advocates of the EU that if it doesn’t move further toward integration, it will fall apart. But the growing criticism of the EU’s inroads on what many British see as their independence and every day life is anathema in London. 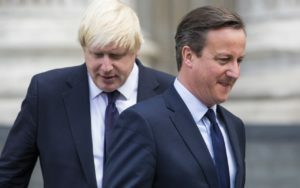 Pro-Brexit Tories have been infuriated by Cameron’s campaign to keep Britain in the bloc and his dire warnings about the consequences of leaving. There is more and more questioning of his political achievements and the debate has turned very nasty. The usually mild-manner former Conservative Prime Minister Sir John Major, an advocate of staying in, has called his Tory opponents “dishonest”, “deceitful” and “squalid” for favoring withdrawing from the EU. Cameron initially promised a referendum on Britain’s EU membership to quell a rebellion by Conservative Eurosceptics but it has turned out to be the opposite, producing a bitter fight which cuts across all party lines. That’s only a year since the Conservatives won a resounding national election but promises now to end Cameron’s reign long before its promised four more years. Cameron had already promised to quit the Party leadership before the 2020 election, and the referendum has given a platform to the contenders to succeed him. That could be Boris Johnson, the former Conservative mayor of London, a much more controversial figure. The offspring of upper class English parents living in New York, he has been called an elitist, lazy and dishonest and accused of using racist and homophobic language. Whether accurate or not, these accusations contrast with what had been a much more generally acceptance of Cameron, and promises political fireworks in the months ahead.